Mike Court, one of the minds behind the Red Mountain “Ground Coffee Taste Without the Grind” advertising campaign in the 1980s, has died of cancer at the age of 54. The Brooke Bond campaign, launched in 1988, featured a range of scenarios in which hosts fooled their guests into thinking they were drinking percolated coffee while in fact they were drinking granulated instant coffee. The light hearted campaign led to an 800 percent increase in sales. 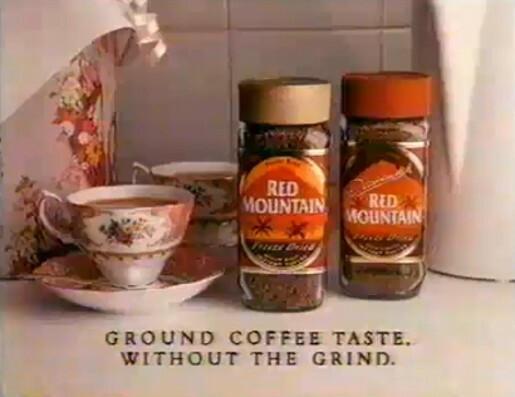 Typhoo Tea, who bought the brand from Unilever, relaunched Red Mountain Coffee in 2009. A well dressed man (Robin Kermode) brings a woman back to his apartment for coffee but feels he should use the time in the kitchen to apply some aftershave. A waiter, who clearly is looking forward to finishing his shift, responds to a dining couple’s call for coffee. The Red Mountain campaign was developed at Still Price Court Twivy D’Souza (Chris Still, Russell Jarman Price, Mike Court, Paul Twivy, Sev D’Souza).